Another race is in the books and SPOILER ALERT: It was a PR- only by 30 seconds or so but it was a PR! The weather on Saturday was beautiful, despite the heavy rain we got earlier that morning. 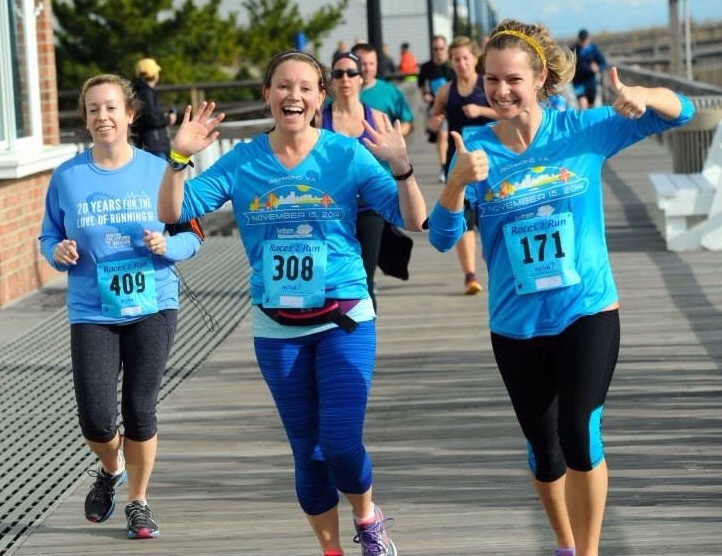 I was excited to run this race because it takes place in the town over and I have never run it before. 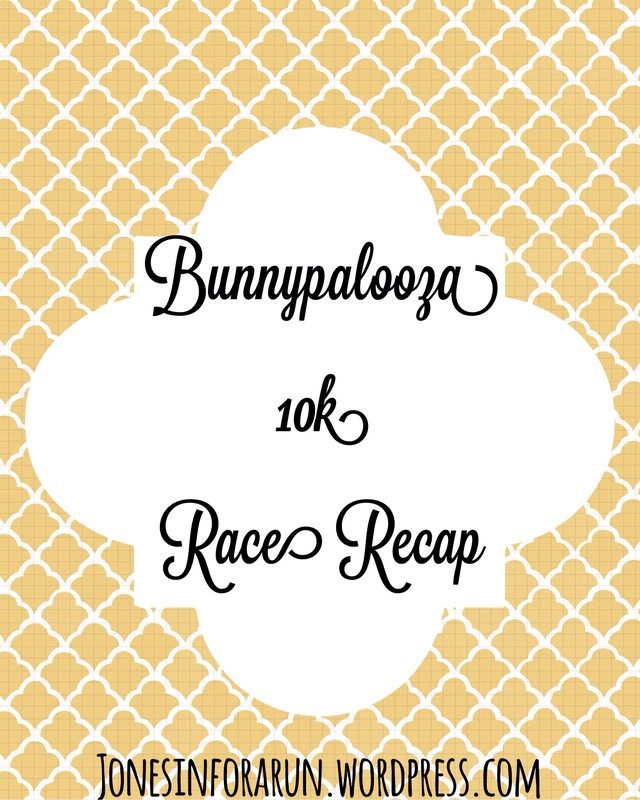 You probably gathered from the name the run was Easter themed! We were able to get our packets the night before (Thanks again Kelly) which meant we could just show up to the race in the morning. It started at 8:30 so we got there at 8 to make sure we could find parking and use the bathroom- usually pre race stuff. We all gathered up on the Bethany boardwalk for some pre-race announcements. One thing we quickly noticed is that it was WINDY- I am talking really windy!!! There was bunny ears flying around everywhere! We knew parts of the race would be hard since we would be running a straight shot down route 1 which provides zero covering from the wind. According to the weather channel the average wind gust was 15 mph with a max speed of 24 mph and a max wind gust of 39 mph- pretty sure we felt that gust at one point in our run!!! It was by far the windiest run I have ever done! We all lined up at 8:30 and hit the streets of Bethany. The race was a double loop so we knew exactly what we would be doing twice. My sister and Lacee both were with me and Kelly was there as well. We all had a goal in finishing in under an hour but knowing that wind was blowing like it was I was just going for a finish- time did not matter. 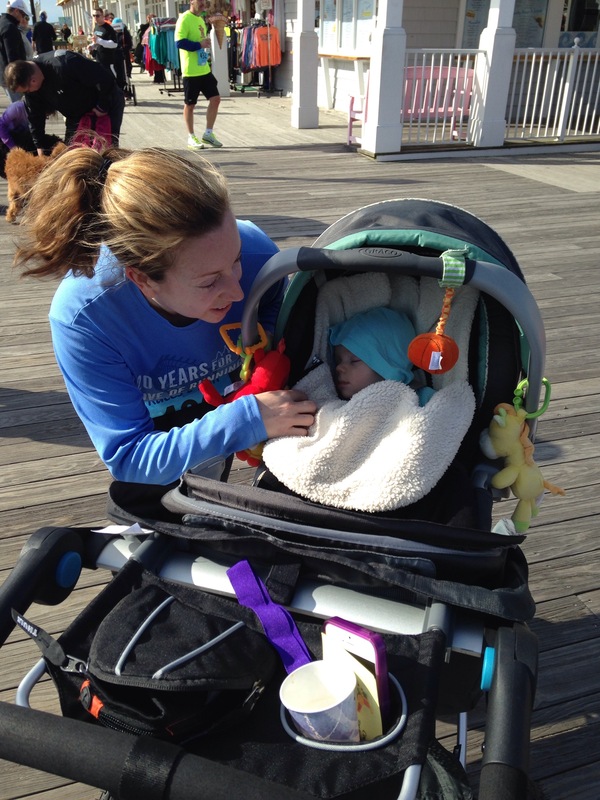 Courtney had baby G with her and Jimmy (her husband) was there as well to run the 5k. It started at 9:30 so we had planned a baby handoff after our first loop. I immediately felt bad for Courtney because pushing a stroller is hard enough but factor in crazy wind and it can be near impossible at times. We finished the first loop which had a nice little boardwalk portion and lots of crowd support and a local photographer taking pictures! Of course we hammed it up. We were now back at the starting line and we picked up the stroller. Shortly after we started ouR 2nd loop I stopped for a walk- I do not know what was going on. Physically I felt fine but mentally I was off my game. I think the wind had gotten to me. Courtney and Lacee went ahead. I was able to catch back up with them but the wind at times was just unbearable and I took a few other short walk breaks along the next stretch of the race. We made it to mile 5 and knew we only had a bit further to go. 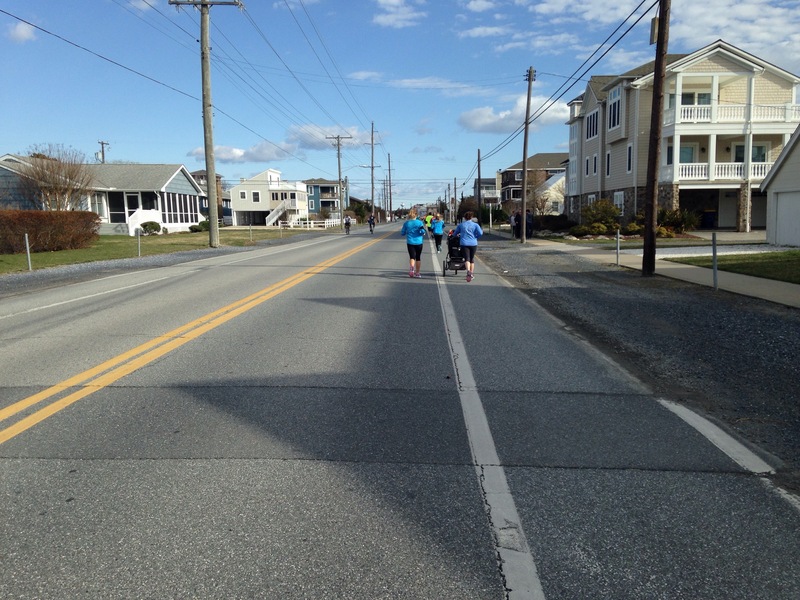 Courtney was beasting it with the stroller and we gladly accepted the wind at our backs for the last mile. We made it back up on the boardwalk and I had accepted that with my walk breaks I would probably be coming in with a time over an hour and I was fine with that. As we got closer to the finish line we saw that we were right around 59:30 so we sprinted with all we had to get there in under an hour! 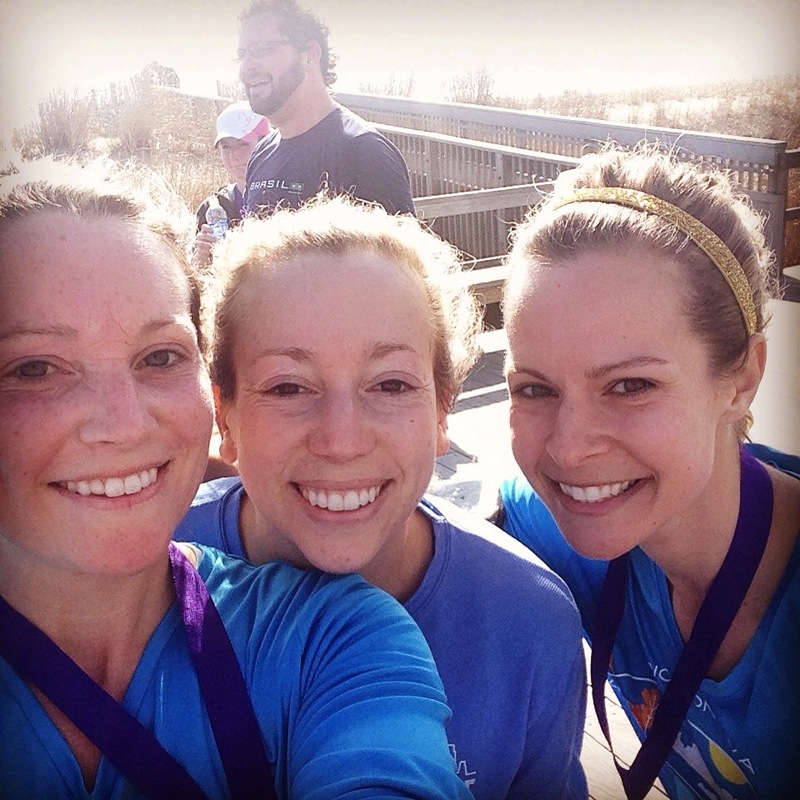 We were handed our finisher’s medals, water and headed on our way I have heard the after party is a lot of fun but Lacee and I headed to One Coastal for an awesome post race breakfast! Besides the wind it was a great race and if you do not mind a double loop I would highly recommend this race! We ended up having an official time of 59:31- Wo hoo! 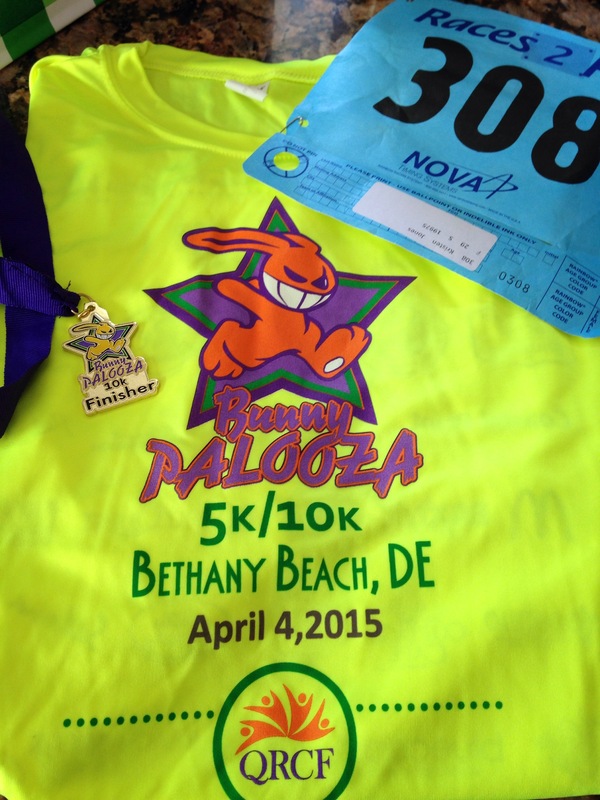 Did you run an easter inspired race? What is the craziest wind you have ever run in?